Ogose Bairin (越生梅林) is a Japanese Plume forest located in Ogose, Saitama. It is considered as one of the three major Ume, Japanese Plum, Spots in Great Kanto Region. There are about 1,000 Ume Trees in this garden, and they will bloom beautiful flowers from the end of February to middle of March. When Ume blooms, there is Ume Festival which you can enjoy great foods. Many people visit here and enjoy the arrival of Spring with beautiful flowers and its sweet smell. 1. use Tobu Tojo Line to Sakado. 2. use Tobu Ogose Line to Ogose(18 min.). 3. use local bust To Ogosebairiniriguchi (10 min.). During the festival, there are many demonstrations and performances, such as the traditional dance show. 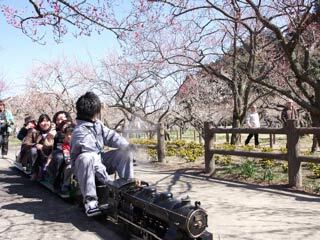 Also, You can enjoy Mini-SL riding which travel though the Bairin.